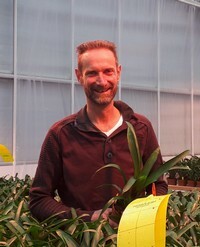 Peter Korsten, Botany, graduated from the HAS Hogeschool, Horticulture and Agriculture in 1993, and founded Botany 15 years ago, a company that develops products for the horticulture sector. Botany is a company focused on cultivation and research. Botany is located in Meterik, and it is a partner company of the HAS Hogeschool in Venlo. Botany and the HAS are, among other things, conducting research together with Signify into plant recipes in the Brightbox in Venlo. How did the start of your career look? Peter: "I have been raised on the tomato nursery of my parents in Panningen. I opted for an education at the HAS Hogeschool because I wanted to take over the company. For a moment, I doubted between the HAS and Wageningen University, but I thought that there was not much room for actual growing at the university, and so I choose HAS. And the funny thing was: at the HAS I found out that there was more than growing only. After the graduation, I decided to continue my studies at the university. Meanwhile, I saw a nice vacancy at WUR Glastuinbouw and I applied. I had already started the introduction week when I was hired as a fertilization researcher. I never started at university." "It is actually a fluke. After that first job, I have had several functions at WUR Glastuinbouw, Eurofins and ICL, such as leading a team of horticulture advisers and a research lab. I also gave advice and was working on product development. in 2003, I was working for WUR Glastuinbouw again, in the midst of a reorganization. At the time, I was working or 2 large customers: the Productschap Tuinbouw and the government. They wanted to make a change towards a more co-creation with companies in the greenhouse horticulture and I developed a plan for it. Because of the reorganization, the plan was put on standby. Together with 2 colleagues, we decided to go on with the plan, however with our own new company. We could strike a deal with WUR Glastuinbouw, and Botany was a fact." What does Botany exactly do? "At first, we were focusing on facilitating research & development in the horticulture sector. We rented space to companies to conduct research. We also grew vegetables, flowers, and pot plants to generate income. In 2008, we added the expertise branch, and we were also supplying knowledge and experiences to companies. In the end, we discarded cultivation. We are now focusing on 6 subjects: plant physiology, seed physiology, entomology, phytopathology, cultivation techniques, and cultivation systems. We develop tests, conduct research, make prototypes, guide the development of products." What makes Botany a success? "We distinguish ourselves from other companies because we focus on the professional gardener, and then specifically the research & development companies: breeders, agro-chemists, and agro-technicians. We think along about developing a product, and the company takes it to the market. The basis of our success is that we started the company with the three of us. We really complemented each other. Now I am doing it alone. Huub has passed away, and Geert has left the company. That took some getting used to, but I have a team of 30 people around me. 5 companies belong to the Botany Group, Botany, Exploras, Innoveins, Innoveins Seed Solutions and BrightBox. When I look back to the original plan, we really kept to it. The vision has not changed, although it has been adjusted to market development. Co-creation is still the main theme in all our work. And we made research affordable. "I used to see myself working in product development, but I did not expect I would combine it with a business. But it turned out like this, and I still like it." How do you look back on your college years? "It were 4 happy years in which I discovered a lot. I was living on my own, and I am glad I made that choice. It gave me independence. And the teacher that I will always remember is Jasper den Besten, who was fairly young at the time, and that made an impression on me. For Brightbox, I often work with him. Now he teaches New Cultivation Systems. I still think that is special." And your wife also studies at the HAS? "Yes, she was doing Environmental Technology. We never met at school, but we did meet when going out. Another advantage of living on your own. We have 3 sons, 11,12, and 14 years olds. They are very interested in plants and my trade, however, from their on perspective. The first likes to work in the garden, the second has more interest in the biology of the plant, and the third is more into the business aspect. You can see the idea young people have of horticulture is very different from when I grew up. In my youth, horticulture was dirty and hard work. Now it is very trendy." What would you say to students now? "Make an effort of the substantial courses. As director, I am much less focused on plants than I used be, and much more on the business side. But just because I have a lot of plant knowledge, I can make the right links in the company, and I know what is really important. In my view, that is the added value of studying at the HAS."